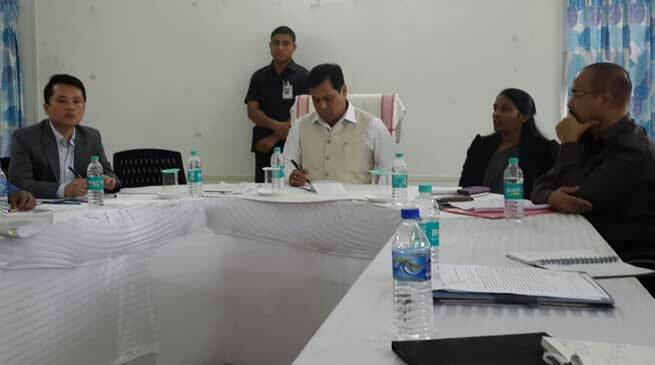 The Chief Minister Sarbananda Sonowal instructed all the departments to work hard collectively for the development, modernisation and beautification of Dibrugarh town. He made this instruction in a review meeting held at Dibrugarh circuit house on Monday. The DC Laya Madduri, CEO of Dibrugarh Zila Parishad Diganta Saikia and representatives of departments of PWD (building), PWD (roads), Public Health Engineering, Water Resource and APDCL. The Chief minister also instructed that the electrification in the villages where, there is still no electricity in the district, road construction and repairing, renovation of buildings in AMC which could not be used for a long time and construction of 4 public toilets in AMC and town. The Chief minister appealed the concerned departments to give priority to the youth entrepreneurs while alloting works to construct govt roads, building and other construction work. The Chief minister also ordered to include names of 63000 more families for construction of toilets under Swachch Bharat Mission in the district.